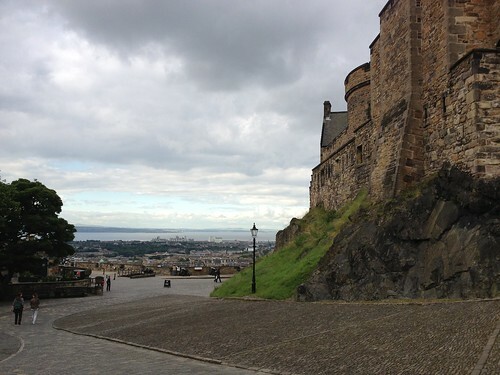 I have a very good excuse for today’s touristy photo: I went on my first tour of Edinburgh Castle! The four of us spent much of the day wandering its fascinating nooks and crannies. Today was a great day all around. It started out in a dismal fashion as I woke up later than planned and locked myself into a despair spiral. When this happens, I can only see how I’ve ruined my whole day, and not how to salvage it. With FunkyPlaid’s help, we rearranged the morning so I could clear my head with a quick run. So I strapped on the shoes and went out, determined to knock back Week 5 Day 3 of the Couch to 5K training — 20 minutes straight of running. It worked. And the exertion and the sense of accomplishment restored my good mood, too, so I fully enjoyed the rest of the day. Running isn’t for everyone, so I’m not going to tell you to do it. I’m still surprised that I like it as much as I do. But regular exercise has improved every aspect of my life so far, and this is just one example of how it works.